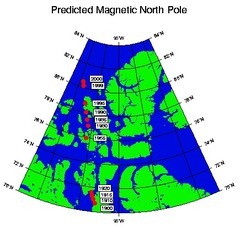 Various claims have been made that indicate a belief that a magnetic pole shift will occur soon, either spontaneously, or as a result of outside forces. Look at the chart to the right. The vertical bar is graduated in increments of 100,000 years. 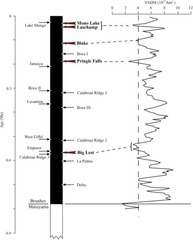 The black section indicates the time period since the last reversal. The dotted vertical line indicates the critical value of intensity below which Guyodo and Valet consider several directional excursions to have occurred2. As you can see, the current field strength is well to the right (stronger) than that value. 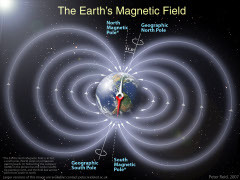 The current magnetic field is stronger now than it has been for most of the Earth’s history, and the field fluctuates quite a bit over geologic time, without going through pole reversals, so the current decline of the magnetic field may have nothing to do with a pole reversal. There is no evidence from any magnetic surveys that we are going to have a pole reversal anytime soon (meaning in the next few years). We may be at the beginning of one now, but we may not. Either way, there is no reason to link it with a date in the near future, and we won't even be able to tell for hundreds of years at least. The doomsayers make much of the fact that the most recent field reversal happened over 700,000 years ago, and that we’re ‘overdue’. Sorry folks, the dynamo effect that drives the magnetic field is not a clock. It doesn’t keep perfect time. 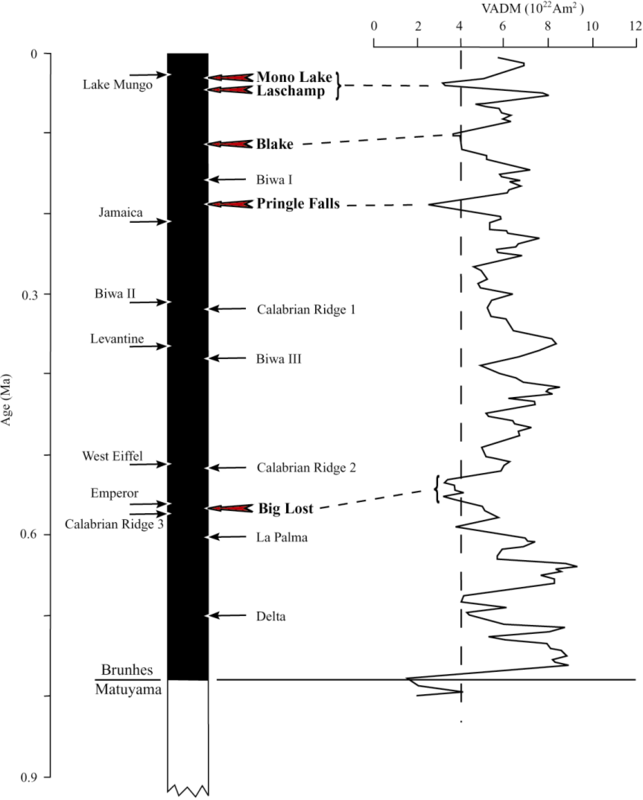 The longest period between pole reversals was over 30 million years! The last reversal was about 780,000 years ago. Contrary to claims made by doomsday proponents there was no associated increase in volcanic or tectonic activity. At his Geodynamo page, USCS Professor Gary Glatzmaier discusses the cause and current state of the earth’s magnetic field. Prof. Glatzmaier does not do any ‘debunking’ on his page, but I link to his page because he gives a good overview of the science behind the magnetic field and the ‘magnetic polar shifts’. Another overview page is here, and a transcript of the PBS NOVA program “Magnetic Storm” can be viewed here. A magnetic pole reversal is a big change, and it takes a long time to unfold and develop. No, the field strength of Earth will not drop to zero. Instead it will start with the magnetic poles splitting, so that we may have two or three North and South poles, instead of the simple dipole we have now. These will wander about for quite a while (possibly thousands of years) before settling down into a new dipole, with the poles reversed. When will this happen? The data indicates that it will take hundreds or perhaps thousands of years to unfold. There is no way to tell if the current decline is the beginning of a pole shift, or if we will have to wait another 10,000 years for it to start. Computer models show us what the entire reversal might look like. Again, keep in mind that these occur in geologic time, not in a few years. Also, the magnetic poles wander now. Various expeditions have reached the NMP (North Magnetic Pole): In 1831 it was found at Cape Adelaide on the Boothia Peninsula. It was in a slightly different location in 1903. It was later found at Allen Lake on Prince of Wales Island. The Canadian government has made several measurements since, which show that the NMP is continually moving northwest. In 1996 an expedition certified its location by magnetometer and theodolite at +78.595, -104. Its estimated 2005 position was +82.7, -114.4, to the west of Ellesmere Island, the biggest of the Queen Elizabeth Islands, in Canada. During the 20th century it has moved 1,100 km, and since 1970 its rate of motion has accelerated from 9 km/year to 41 km/year. If it maintained its present speed and direction it would reach Siberia in about 50 years, but it is expected to veer from its present course and slow down. This movement is on top of a daily movement in which the NMP describes a rough ellipse, with a maximum deviation of 80 km from its mean position. This effect is due to disturbances of the geomagnetic field by charged particles from the Sun. So, all of this movement in the NMP happens now. What ill effects have you noticed? The only thing we have noticed is that we have to update the declination setting on our compasses from time to time (about once a decade). Magnetic field reversals are caused by the dynamic nature of the Geodynamo. The Earth's magnetic field is not determined by exterior forces, such as the magnetic field of the Sun, or of any other object. Claims that an exterior force (such as another planet) can move the core, and therefore move the magnetic field of the earth are based on a fundamental misunderstanding of the structure of the Earth, and on the inverse square law. In conclusion: We have shown that there will be no spontaneous magnetic field reversal in the near future, that field reversals take a minimum of several hundred years, and that they are caused by the internal geodynamo, not by external agencies such as passing planets. 4. Geophysical Research Letters, DOI: 10.1029/2010GL044286.